FREE- FREE Shipping on Online Orders over $100. FLAT - 1/2 Price Shipping on Online Orders over $75. Home → SALES → MOTHER'S DAY → Rose of Sharon Scripture Tin - "Do not be anxious.."
Rose of Sharon Scripture Tin - "Do not be anxious.."
"Do not be anxious...by Prayer & Petition with Thanksgiving present your requests to God" is the encouraging scripture from Phil. 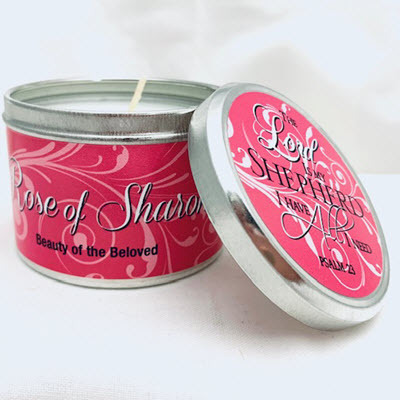 4:6 on our fabulously fragrant, Rose of Sharon silver-tone candle tin. This 6 oz candle, with burn time of 12-14 hours, makes a great gift for under $10! Sign up to hear about new product releases, exclusive sales & news!